Cruising by boat along Puget Sound’s crooked shoreline, it was easy to observe some wonderfully common aspects of coastal geology. Pale naked cliffs towered 50 to 100 feet over the shore at various locations. Wispy deposits of sand and gravel stretched out into the water. And long ribbons of beach — wide in some places, narrow in others — extended forever along the water’s edge. Meanwhile, single houses or clusters of homes protruded from the wooded slopes, where the terrain rose and fell as the boat raced on, traversing the eastern shoreline of the Kitsap Peninsula near Kingston. An untrained eye might gaze upon these natural features with mild feelings of awe or wonder. But to a coastal geologist like Hugh Shipman, these are the diverse pieces of a complex puzzle. The puzzle pieces all fit together to tell a story about the dynamic processes shaping the shoreline of Puget Sound and influencing all creatures that live here. Shipman, who has worked for the Washington Department of Ecology for 25 years, agreed to explain how he sorts these geological features into a unified picture of Puget Sound. Paul Dorn, a longtime biologist for the Suquamish Tribe, drove the boat and offered observations about how the geology connects to marine life. Not long ago, Shipman co-led a major study to map these processes. The study, funded by the Environmental Protection Agency and coordinated by the Washington Department of Fish and Wildlife, has led to an extensive mapping of natural shoreline features, which can now be used to set priorities for restoration. Humans have altered Puget Sound’s shorelines for 150 years, often to the detriment of fish and wildlife, Shipman said. But things can be repaired to a degree by understanding the natural processes of erosion and sediment movement. “If nine out of 10 storms come from the south, the net drift will be to the north,” Shipman said, noting that sands and gravels may move along a beach for miles before finding a place of deposit. As Dorn steered the boat toward President’s Point south of Kingston, Shipman noted that some geologists describe beaches as “rivers of sand.” But in Puget Sound, beaches don’t always act that way. In a river, he said, one can be fairly certain that sediments will move in only one direction — downstream — as the force of gravity drives the flow of water. In fact, Puget Sound’s uneven shoreline, shifting tides and changing weather can result in waves and tidal currents that do not conform to easy patterns. Sediments moving in opposite directions on the same beach can come together and pile up, forming sand spits, such as Dungeness Spit near Sequim and many smaller spits throughout Puget Sound. Beaches of sand and gravel are essential habitat for two types of tiny fish that lay their eggs in the intertidal zone between high tide and low tide. Both surf smelt and sand lance are important food sources for juvenile salmon as well as a variety of birds and marine mammals. Surf smelt prefer a more gravelly substrate, while sand lance will lay their eggs in sand or a mixture of sand and gravel. Arriving at President’s Point, Dorn cut the boat’s motor to a dull roar, as Shipman gestured to a location where a curve in the shoreline slowed the migration of sand and gravel, building a sand spit with a highly productive saltwater marsh behind it. Dorn pointed over the side of the boat to dark, undulating patches beneath the waves. Those are eelgrass beds, he explained. They form a rich habitat with food and shelter for a host of species, including juvenile salmon. All along the shore, but especially near sand deposits, a platform of sediment protrudes out into Puget Sound well beyond the low-tide mark. The water here is shallow enough for sunlight to penetrate, giving these plants energy to grow. As the boat continued south toward Point Jefferson, Shipman noted a sharp curve in the shoreline that forms a blunt point of land. From this location, the sand and gravel can move away in opposite directions along the shore. “Point Jefferson is a classic feeder bluff,” Shipman said, using a term that describes the source of sand and gravel that “feed” nearby beaches. “Because waves are coming straight into the bluff, the beach material may get moved one way or the other,” he explained, adding that geologists call this a “divergent stretch” of shoreline. The researchers also noted that bulkheads built by property owners to reduce shoreline erosion have created environmental problems in many areas. About one-third of all shorelines that have been modified with bulkheads — some 147 miles — were serving as important feeder bluffs before development took place. The new maps provide a tool for identifying shoreline areas that could benefit the most from bulkhead removal and restoration of important sediment sources. Teri Munter and her husband Ben Elmer live along this stretch of beach south of President’s Point, where their house sits atop a 50-foot bluff. At the base of the slope is a bulkhead installed by a previous owner — a bulkhead that was being removed as Dorn steered the boat in toward a barge engaged in the dismantling project. Munter has talked about hearing of Kitsap County’s bulkhead-removal program three years ago while discussing native plants with local experts. She wanted to reduce the size of her grassy yard but found herself drawn to the notion of removing the bulkhead down on the beach. At the top of the bank, where the homes are located, there is no difference between properties with and without bulkheads, Munter said. Yet at the bottom of the bank, on the beach itself, the neighboring property without a bulkhead has nice deposit of sand and gravel, along with an accumulation of driftwood. Driftwood high on a beach contributes to the overall food web of Puget Sound, but it is rarely found in front of a bulkhead, Shipman said. 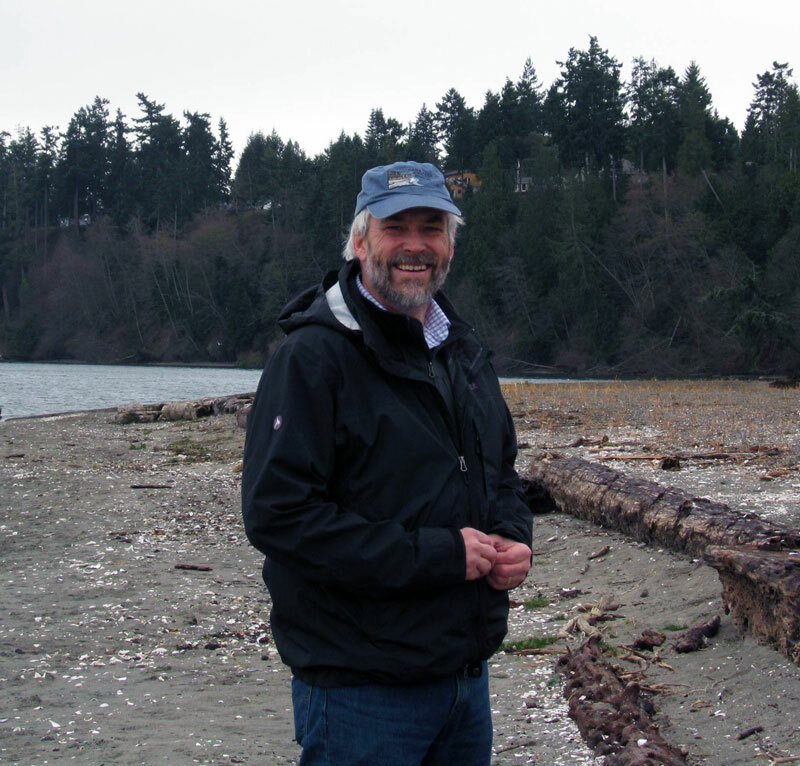 Because of the complex geology of Puget Sound shorelines, shoreline property owners are wise to consult with experts about changes to their property, Shipman said. 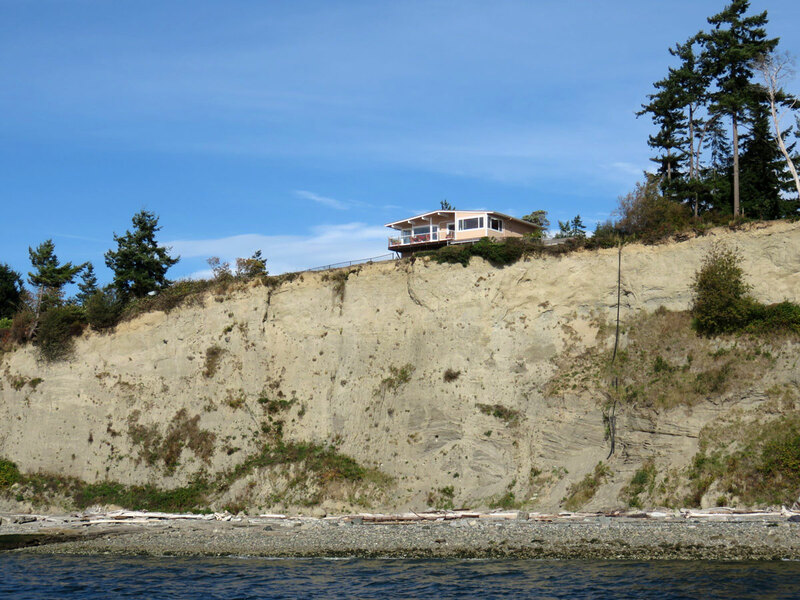 Bulkheads may prevent some erosion at the toe of a bluff, but they rarely reduce instability at the top where the houses are located. As Dorn steered the boat back toward Kingston, Shipman explained how these various pieces of the geologic puzzle come together to form a basic unit called the “drift cell” — a section of beach with its own sediment load. Drift cells are made up of feeder bluffs, which supply the sand and gravel; a transport zone in which the material moves in one direction along the beach; and areas of deposition, such as sand spits. Rivers deliver sediment into Puget Sound, but they contribute a very small percentage of sediment in most drift cells. Most river sediments drop out into deep water or else build up in the river delta. With careful study, one can develop a sediment budget for each drift cell, measuring the amount of erosion feeding into a drift cell and subtracting for losses of sediment to deep water. The rest of the sand and gravel either ends up as deposits in a sand spit or in the offshore platform. When considering the effect of bulkheads on an ecosystem, it is important to study the sediment movement within that localized drift cell. “When you place a fixed structure on a dynamic shoreline, the consequence may be to cut off the supply of sediment,” Shipman said. According to Shipman, many bulkheads and sea walls get constructed by nervous property owners after a minor landslide occurs. The long-term erosion rate may be just an inch or two per year, but several years of erosion are likely to take place all at once, often during a storm. In some cases, moving an existing house back from the beach may be a cheaper option than building and maintaining an expensive bulkhead for the life of the house, he said. Sometimes homeowners must maintain an existing bulkhead to protect their houses against heavy waves. In Puget Sound, this may occur where the shoreline is exposed to open stretches of water facing into prevailing winds. Generally, new homes can be built far enough back from the beach to avoid the need for a new bulkhead. Over the long run, maintaining and restoring natural shorelines offers the best hope for the future — even in the face of rising sea levels caused by global warming, Shipman said. As sea levels rise, so will the rate of erosion, but the liberated sediments could build up the beaches, somewhat offsetting the overall effect. Understanding how nature works in a shoreline environment is an important step to protecting waterfront property while restoring a functioning ecosystem. A study by Earth Economics in concert with the Coastal Watershed Institute examined two drift cells in Clallam County to get a handle on the economic value of intact feeder bluffs. One drift cell was in the Elwha River area, where 60 percent of the feeder bluffs are armored with seawalls. The other drift cell was in the Dungeness River area, where the feeder bluffs were mostly natural. 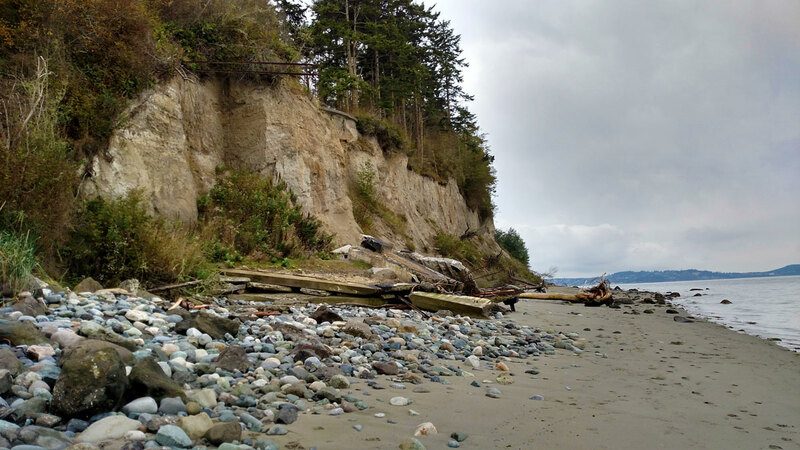 The researchers found that beaches along the Strait of Juan de Fuca are largely starving for sediment, since the rate of sediment transport is greater than new sediment coming from the feeder bluffs. One effect was a continual lowering of the beach elevation, which subjected unarmored bluffs to even greater waves and erosion. In the Elwha drift cell, the city of Port Angeles spends up to $1 million a year to maintain the integrity of Ediz Hook, a sand spit that serves as home to a Coast Guard station and Nippon paper mill, according to the study. In a natural system without seawalls blocking the sediment, no maintenance would be necessary, since the spit would continue to build up from the natural deposition of sand and gravel. 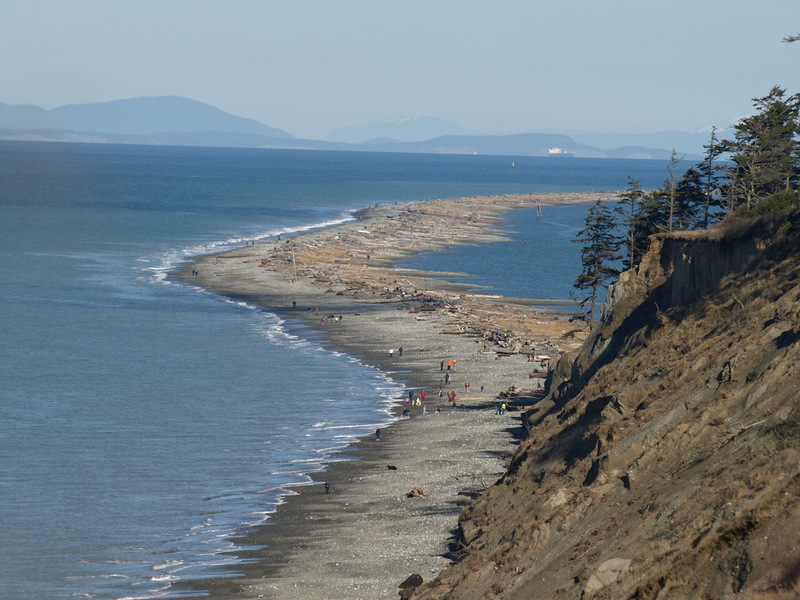 The researchers valued the migrating sand and gravel in the functioning Dungeness drift cell at between $250,000 and $500,000 per year, whereas materials in the Elwha drift cell were worth between $100,000 and $200,000 per year. 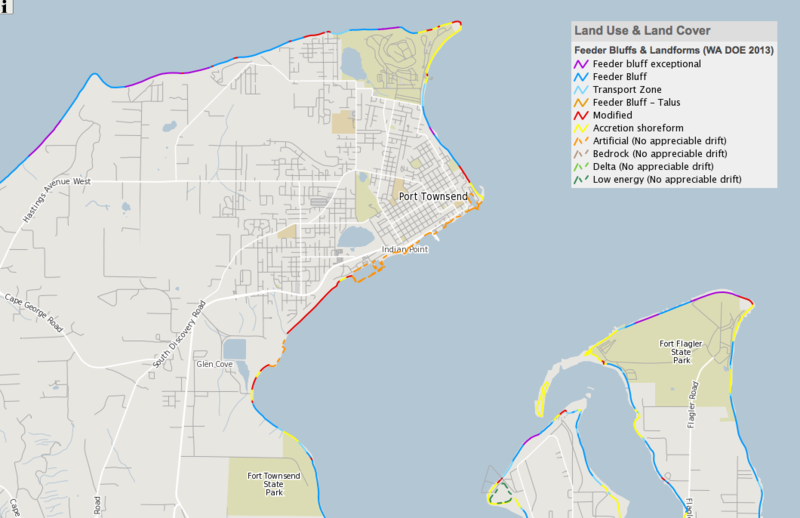 Comparing areas with and without a seawall, they found that natural feeder bluffs were worth at least three times as much per foot as those armored with a seawall. When accounting for the value of eelgrass beds, saltwater marshes, spawning areas for surf smelt and sand lance, and other factors, natural feeder bluffs in Clallam County are worth millions of dollars per year, the study concludes. Sources: Kinney et al. (2015). Analysis of effective regulation and stewardship findings: A review of Puget Sound Marine and Nearshore Grant Program results, part 1. University of Washington Puget Sound Institute. 57 pages.